Aspen Pumps’ new Silent+Mini Lime pump has a soft start function to minimise noise levels. UK-based Aspen Pumps has released its next generation of the Silent+ Mini Lime condensate pump, which features anti-vibration pulse damper technology for quiet operation. The new mini pump offers whisper quiet operation, which makes it suitable for office and meeting rooms, and has simple maintenance, touch control with site-specific commissioning and 4-stage-filtration. The pump’s design now features a soft start function, a range of sound dampening technology with built-in sound adsorbing materials including an anti-vibration pulse damper (patent pending) and an anti-vibration mounted motor. It only pumps when needed so motor noise is reduced, allowing cost and energy savings, along with a longer motor life. The Silent+ Mini Lime also features new touch control options, offering site-specific commissioning and allowing engineers a choice of mode for the safety switch. The touch control gives LED feedback providing a visual operation guide for engineers to check whether the pump is running and that the safety switch is operating. 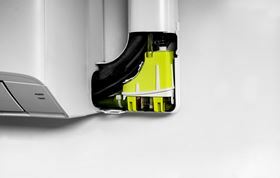 Designed for high wall split systems, the Silent+ Mini Lime sits in the trunking elbow and is suitable for a range of trunking systems with left or right install options. A quick release reservoir allows for simpler removal for faster servicing and the 4-stage filtration reduces blockages. The Micro-v i4 mini pumps are being used in a multi-million pound residential development in Kings Cross, London.